Goat milk natural handmade soap has pure goat's milk with no added color and is unscented. It has thick, rich creamy bubbles and won't dry your skin out. It's wonderful for any type of skin, including sensitive. Goat Milk Artisan Soap is made with pure goat’s milk for gentleness. For thick, creamy, rich bubbles with no drying of the skin look no further. This natural, handmade soap has pure goat's milk as one of its main ingredients. It comes by its color naturally and has no added scent. This soap is gentle and mild enough for even sensitive skin. It has lots of creamy bubbles that clean the skin, but won’t strip it. This soap has been used on babies with sensitive skin with good results. Goat milk is gentle on your skin because its pH level is close to your skin's pH level. 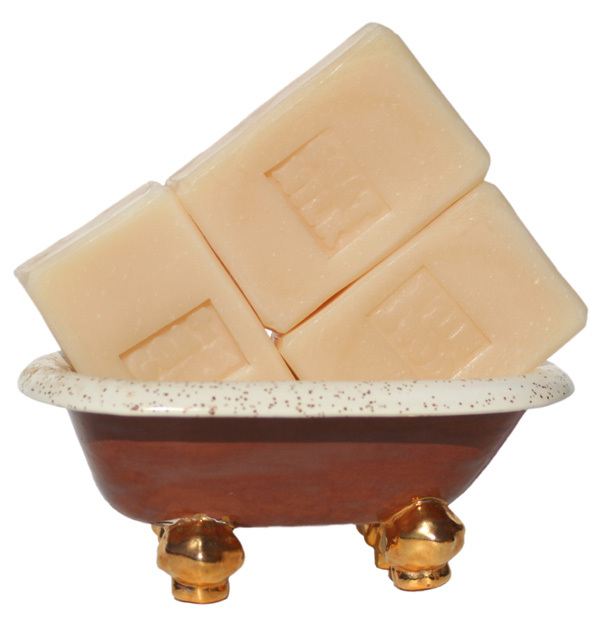 Each goat’s milk soap is made with natural ingredients. The main ingredient is goat milk of course, followed by virgin olive oil, coconut, palm kernel, castor and mango butter. My batches are cured for extra length of time, to make sure they are mild and gentle. This is one of the mildest handcrafted soaps that I sell along with pure Olive oil unscented soap. It is beneficial for dry, oily, acne prone, T-zone, mature or sensitive skin. I always keep this soap on hand. Handmade soap makes its own glycerin. It’s best to keep goat milk soap out of water puddles, away from direct stream of water, use a draining soap dish and dry the soap between uses. Ingr: Goat Milk, Olive oil, Coconut, Palm Kernel, Mango Butter, Castor oil, Soybean, Sodium Hydroxide, Beeswax, Sodium Lactate.